“If I had a hammer, I’d hammer in the morning. I’d hammer in the evening, all over this land.” (The Weavers) There was less hammering around the country in December, as construction of new homes saw a steep decline from November. 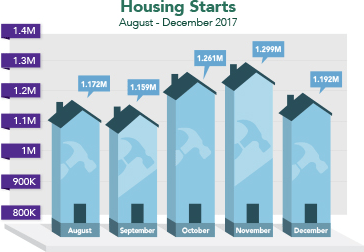 December housing starts came in at 1.192 million annualized units, the Commerce Department reported, falling 8.2 percent from November and driven lower by a sharp decrease in single-family units. December’s reading marked the largest monthly percentage drop since November 2006. Single-family starts plunged nearly 12 percent from November, though they did increase 3.5 percent from December 2016. Multi-family dwellings rose 2.6 percent from November but plummeted 21 percent from the same time a year ago. Building permits, a sign of future construction, were essentially unchanged from November at an annual rate of 1.302 million units. Overall, this was a disappointing report for potential homebuyers facing inventory shortages around much of the country. Homebuilders are still feeling confident, however, as the January National Association of Home Builders Housing Market Index came in at 72, just below the 74 registered in December. The index measures data from a survey of homebuilders and asks respondents to rate conditions for current single-family home sales, sales in the next six months and traffic from prospective buyers. Any reading over 50 is considered positive sentiment. The markets were volatile in recent days as the threat of a government shutdown loomed, causing mortgage bonds to move lower. Though home loan rates have risen, they remain attractive and near historic lows. News on the housing sector and economic growth dominate the second half of the week. Look for housing data on Wednesday with Existing Home Sales, followed by New Home Sales on Thursday. Weekly Initial Jobless Claims will also be released on Thursday. On Friday, Durable Goods Orders and the first reading on fourth-quarter 2017 Gross Domestic Product will be delivered. If you or someone you know has questions about home loans please contact me. I’m always happy to help.